Easy cookies perfect for that jolly visitor. Prepare Topping: In small mixing bowl stir together sugar, sour cream and cinnamon until smooth. Stir in walnuts; set aside. Prepare Dough: In mixing bowl bream butter and sugar. Add egg and vanilla; beat until light and fluffy. On low speed gradually add dry ingredients, beating just until smooth. Divide dough into twelve equal parts. Roll dough into balls and place 3 inches apart on ungreased baking sheets. With your fingertip, make a wide, round depression in the center of each cookie, reaching almost to the edges and leaving a rim. 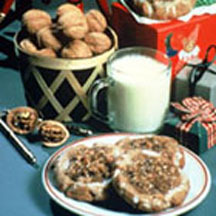 Fill depression in cookies with walnut topping, mounding fairly high above rims. Bake in 350°F (175°C) oven 15 to 20 minutes, until filling is set. Transfer cookies to rack to cool. To make icing, mix powdered sugar and water until smooth. Drizzle over rims of cookies.